Our aerial filming and photography drones utilise an innovative four or six-rotor design and a vast array of sensors plus on-board electronics allowing them to manoeuvre precisely and quickly. Their unique design also maximises flight times and minimises noise levels - they are quiet, eco-friendly and very unobtrusive. 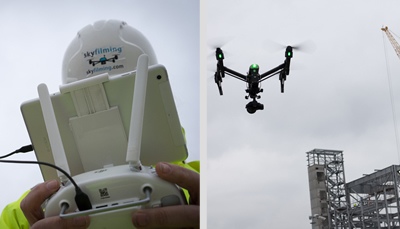 We utilise drones of various sizes and capabilities to suit different tasks, such as flying indoors, close, detailed inspections of roofing, high towers and chimneys, re-programmed routes to follow boundaries and specific areas, object tracking, like following a car for a commercial shoot, thermal imaging to detect insulation efficiency, criminal activity, electrical faults and search and rescue applications, 360 panoramic videos and photographs from the air, plus a whole host of uses too numerous to list. The on-board GPS, GLONASS and barometer means that it is possible to command our drones to hold a GPS position and/or altitude, giving us very precise control over where the drone goes and captures aerial photographs or video. In-built safety measures ensure that any risk from failure or malfunction is minimised. Should a drone lose contact with the hand controller, it will automatically return to base then begin a slow decent and land. Automatic channel selection eliminates frequency conflicts and ensures a secure connection whilst high visibility navigation lights and low battery alarms ensure safer general flight practices. 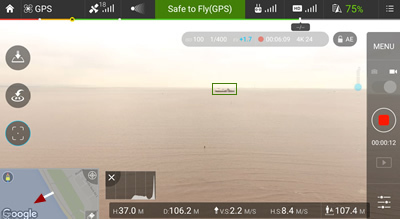 The ground station consists of a tablet, Android or iPad, connected to the drone pilot software, and/or a live video feed. This allows video from the drone to be viewed in real time, along with full telemetry and navigation information. It allows the client to be involved with shot selection or directing the camera during surveying exercises. The ground station software also enables the drones to be programmed with a pre-defined flightpath around a particular subject. 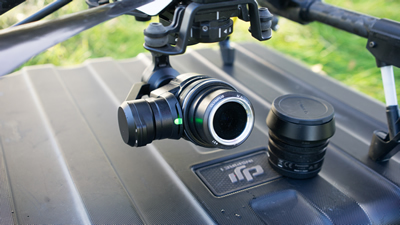 The handheld radio controllers allow our drone operators to control various Camera Payloads independent of flight direction, aiming at a subject and shooting pictures or videos. It is also possible for the client to see a live view from the drone if this is required. Sky Filming drones carry a number of Camera Payloads, including high megapixel stills cameras and built in 4K video cameras. We use high quality digital stills cameras that are controllable from the handheld controllers. This is excellent for promotional fly-bys and for condition and roof surveys of buildings. It is also possible to connect low-light and thermal/ infra-red cameras. These can support a number of fields, from Achaeology, surveying of poorly lit interiors to survellance and security of property. Sky Filming can acquire the perfect imagery you need.